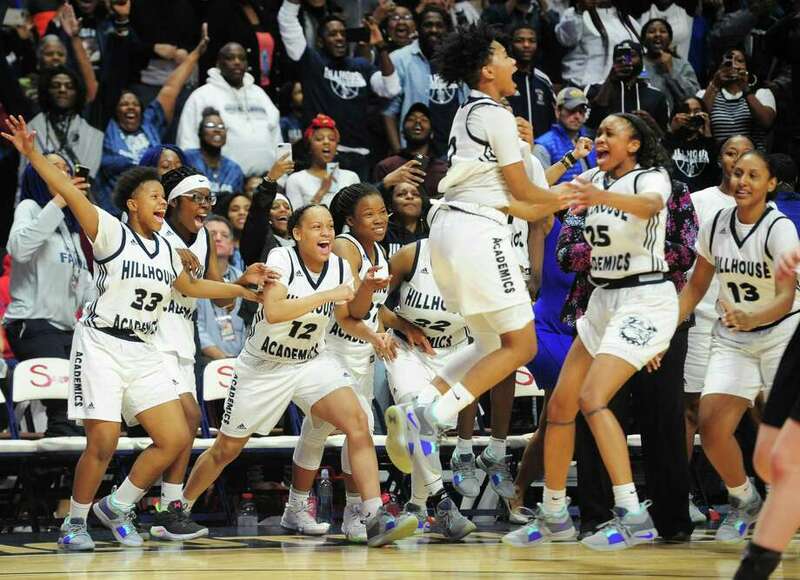 The Hillhouse girls celebrate the Class L state championship victory over Hand on Saturday at Mohegan Sun Arena. 9 a.m.: Fans were already lined up at the ticket window an hour before game time. It looks like the entire town of Granby is here. 9:55: The chants of “Danny Melzer” go up from the New Canaan student section. Melzer has done a fine job turning the Rams’ program around in a short period of time. 10:20: I spy Chris “Mad Dog Russo” in the New Canaan rooting section. The radio personality has a son on the team and has talked plenty about the rise of the program on his show. 10:50: Halftime of the Division IV final, one of several Unified games is now being played. One of the kids from the Newtown side goes up to the military personnel on hand and thanks them all for their service to our country. 11:27: There is still over 3 minutes left in the Division IV final, but the “Hey, Hey, Goodbye!” chants are coming from the New Canaan student section. They are correct: Rams win first state championship since 1962. 2 p.m.: Trinity Catholic girls top Canton in Class S final. Mike Walsh wins his eighth state championship, seven previously with the Trinity boys. Walsh had previously stepped down as the head coach, stayed on as an assistant and was in Florida when he got the call to take over the head girls job on an interim basis. My guess is he won’t be back, but you never truly know with the wily veteran. 3:30 p.m.: New London has the lead and the crowd advantage in the Class LL state final. CIAC wisely put the Whalers in the final spot of the first session. 4:22: Norwalk has almost come all the way back, trailing by just three points with under 3 minutes left. 4:30: A tough non-call goes against New London and Norwalk finishes off the comeback in LL with a dramatic last-second shot. 6:25: Hillhouse is up 14-0 over Hand in the Class L girls final. 6:48: Hillhouse couldn’t put Hand away. The Academics lead 21-12 at halftime. People are filing in upstairs at the arena for the Division I boys tilt to follow. Hillhouse band is worth its own price of admission. 7:45: Academics hang on to win. Head coach Catrina Hawley-Stewart moves to 6-0 in state finals. 8:07: Windsor students with the “Overrated” chant. It’s still 10 minutes before tip-off of the Division I boys final. 9:45: East Catholic defeats Windsor before almost 7,000 people. Fabulous game to end the day. 11:15: East Catholic emerges onto the empty arena court to take videos and selfies. The Eagles are gleefully soaking in the moment. I would have clapped, but I was still writing because I’m the slowest writer in America. 11 a.m.: Innovation is on a 28-8 spurt, dominating Old Lyme in every facet of this Division V boys final. Noon: Innovation completes a marvelous season, winning its first state championship in just its fifth year as a varsity program. 1:50 p.m.: Amistad’s great first half in the Division III final becomes a memory as Farmington erases a 9-point deficit in 59 seconds, then establishes control with the completion of a 15-2 run. Indians make six steals in the third quarter. 2:20: A.J. Edwards fouls out of his final game for Amistad. Has done plenty to put the 10th-year varsity program on the state map. 5:05: Sheehan’s comeback in the Class M girls final falls just short. Cromwell wins the title. Crowd has started to file in for the final game of the weekend. 6:10: Waterford had the shorter drive, but it’s New Britain with the crowd advantage, the early lead and a band to rival Hillhouse. I see where Yale is playing LSU in the NCAA tournament on Thursday, just not in Hartford where I hoped. 7:30: Ryan O’Donnell with the slam for Waterford with a minute to go. The Lancers are going back to back — sort of — after winning Division III last year and now Division II. The announced attendance for the weekend is 20,930. 10:30: Does it really surprise you that I’m the last person to leave the Arena? It’s only nine months until tip-off for next season.